I am a bird-watcher wannabe! I have the the field guide, I sometimes wear the binoculars around my neck (yeah, I'm a dork) and I always put out birdseed in my yard. I have some little house sparrows that always nest in my carport and they LOVE the seedcakes from Wal-Mart that fit into the little cages. Well, as I learned last week, so does our neighborhood squirrel! 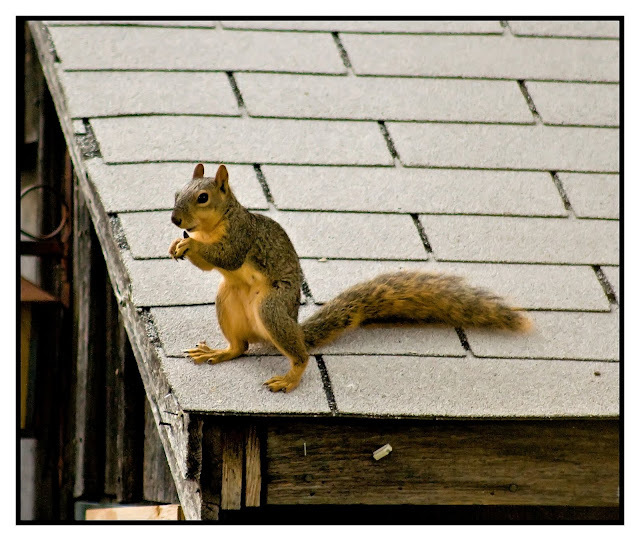 We caught him having a little afternoon snack on top of our toolshed! TOOOO FUNNY!!! Love that you caught him in the act! This is a RIOT...aren't they just the silliest things. Lori, my husband just LOVED these pictures, he could see them from across the room, then when I told him the title and read him the post, he laughed!! Isn't that funny! We had to get a squirrel proof feeder because of this problem. Good shots! I'm a birder, too, and those squirrels are my nemesis. 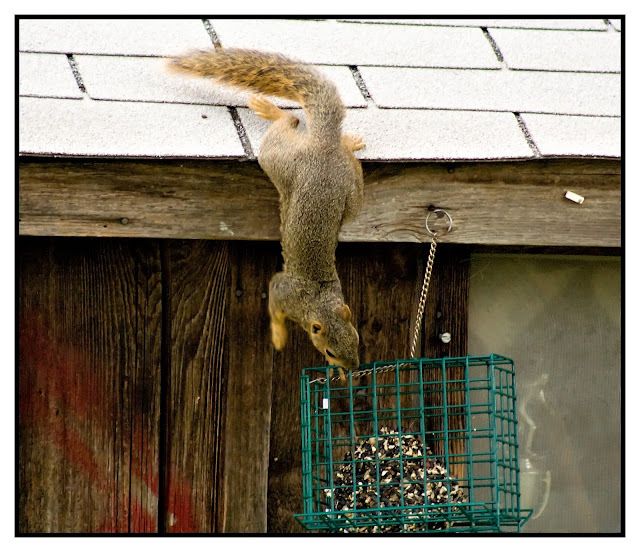 :-D I just got this new bird feeder thingy that spins around and knocks squirrels off. Now I can't wait for a squirrel to come so I can watch him fly.